The exhibition “Cassini’s Dreams” consists of an interactive installation, painting and a virtual reality app. The installation features an inflatable of Saturn being “read” in real time by a Cassini laser-to-audio system to produce a rich audio experience, built from raw data and artistic interpretation of the two decades of Cassini’s tour. There Cassini was our virtual eyes and ears on Saturn. As the probe swept past the gas giant, traveling above and below her rings, swooping down on moons to fly through icy plumes, above methane oceans, past shepherd moons guiding ring particles in their orbits and spying  on propeller moons as they create delicate internal structures and waves. The paintings are also inspired by the rings of Saturn as seen by the spaceship Cassini. 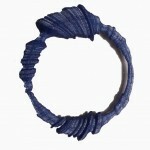 For this body of work China Blue utilizes the infrared color spectrum. Humans can not see in this color range but with China Blue’s appropriation of the palette she makes visible the invisible while citing this scientific application which helps researchers see photographic images in high detail. The final element, the Virtual Reality app is a wayfinder that can be used in Venice to find the exhibition as well as by those who are not able to attend. Likened to Cassini’s search for the Saturn, the app enables everyone to participate in their own exploration of Saturn and her rings through the app. This work is supported in part by a NASA/RI Space Consortium, Canada Council of the Arts and The Engine Institute a non-profit dedicated to promoting artists working at the intersection of art, science and technology. 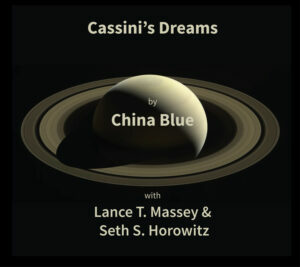 The Planetary Radio’s episode “Chasing New Horizons to Pluto…” ends with a track from our CD “Cassini’s Dreams”! Planetary Radio  is a weekly 30-minute radio show devoted to space exploration and astronomy, hosted and produced by Mat Kaplan and The Planetary Society. The Planetary Society is the largest and most effective nonprofit organization that promotes the exploration of space. “Cassini’s Dreams” brings to life some fascinating unheard aspects of Saturn’s rings. Since Galileo’s first tenuous observations in 1610 and the Saturn system has remained a source of intrigue for centuries. To this day Saturn is still one of the solar systems prime objects of wonder. In 1997 we launched the Cassini probe in a 10 year voyage to study the Saturn system, closer than any human object had ever been before. Over its 20 year mission, Cassini sent back over 400 gigabytes of raw data including over 400,000 images of Saturn, her rings and moons. The vast majority of this information was in the form of black and manipulated to form elegant full color portraits and movies of the unEarthly beauty of the Saturn system. However, the sheer magnitude of new information and the unexpected form much of it took, begged for new ways to explore the planet and the data. Although Seth Horowitz and I did not know Pauline well, once we met her and her partner Ione, we quickly grew to greatly respect them and the depth of their work. Pauline Oliveros (1932-2016) is known for her lifetime spent as an electronic musician creating early improvisations in the 1950’s with Terry Riley, Loren Rush and then working with Ramon Sender and Morton Subotnick who found the San Francisco Tape Music Center. Later Pauline developed the Deep Listening Institute (now at Rensselaer Polytechnic Institute, NY) which is as much a philosophy as it is a creative practice. In addition to her creative vision her work creating a community of listeners was the force that has made her an icon. This group of people around the world includes not only well known composers but also students, friends, dancers and artists. It is this community of people who are now her voice that will continue her deep listening practice. We were contacted with a the request of a composition of 85 seconds long to present to Pauline on her 85th birthday which would have been on May 30th of this year. Yet in November of 2016 we heard that the works collected would become a memorial event instead. The event has become a concert, an exhibition and a conference which will run from June 1-3rd at McGill University. In addition a website titled “Still Listening” Pauline Oliveros” has been created to present the scores, the works and the composers in the series of events. Credit for this overwhelming task goes to the organizers Eric Lewis and Ellen Waterman as well as the curators Katherine Horgan, Dancy Mason, and Landon Morrison who have not only organized and curated the event but also commissioned Director Amy Horvey to direct the concert. Our contribution Theta for Pauline is a work that is based on the theta brain wave which appears during meditative, hypnotic or sleeping states and is one of the five brain waves produced by the brain. When looking at brain waves we are looking at the brain’s activity and seeing one of nature’s most complex patterns. Theta for Pauline is an ode to an enormously compassionate woman who touched many lives and through her meditation on sound brought us to a new understanding of it. Our score is a 3D printed ring based on the theta brain waves. The circle layout indicates the continuous nature of Pauline’s Deep Listening impact that has span generations and continues to grow. We mourn her death but will continue her vision. Unusual Music and Radio Broadband featured China Blue’s “The Calls” in a special 9/11 episode. 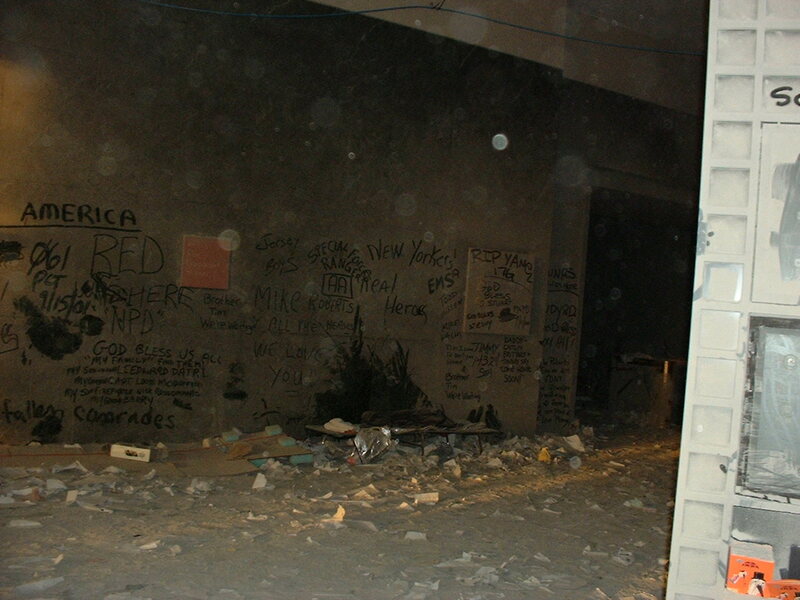 “The Calls” by China Blue is an ode to the people lost resulting from the attack of the World Trade Center. The artist has donated the work to Unusual Music and Radio Broadband  for this episode with her message of peace exclusively for the listeners of Unusual Music and Radio Broadband. “Negative Ellipse” is a based on the acoustic environment created by a sculpture by Richard Serra. The audio produced is the actual vibrations of the steel of one of his “Ellipse” sculptures combined with ambient acoustics making the resultant sound piece and the entire acoustic space of the room in which it is played the ‘negative space’ of the ellipse. “8-Bit Cricket” was exhibited in Tokyo Wonder Site’s Experimental Art Festival, October-November 2009. With this work I was interested in mimicing the behavior and sounds of the cricket. Like nature the crickets sing when it is dark and are quiet during the day when it is light. “8-Bit Cricket” functions simularly. It is shown in a darkened room. Each one has its own Led attached to the ‘cricket cage’ to randomly trigger the cricket circuits off, resulting in an intriguing sonic experience that is tuned differently in each room. The video is of an installation in one of two rooms where the work was shown. This version encourages people to “gig” with the circuits with a flash light. In 2008 I was the US Representative with “Aqua Alta“ at OPEN XI International Exhibition of Sculpture and Installations held in conjunction with the Architecture Biennale at Isola di San Servolo, Venice, Italy. This work was curated by Edward Rubin a New York based writer and critic. The sound of Venice is water. Every minute of every day and every night the sound of water is splashing on the stairs, lapping at the doorways and rises in waves as gondolas breeze across it. From the founding of Venice, to the present day, water is the source of transportation, a symbol of romance and the element that made Venice a major maritime power and a significant trading port. Water is also its problem. Global-warming has induced changes to the aquatic environment causing the waters to swell filling the piazzas and buildings and threatening the daily life and culture of Venice. Listen to the sound piece here. Aqua Alta is an immersive 5.1 sound experience created using specialized audio equipment to capture the unique sounds of the waters of Venice via the gondolas that glide through them. This work was inspired by the effects global warming have on the environment, both underwater and above. Types of Recordings used: binaural recordings of the gondolier singing and the ambient sounds, vibrations from the floor of the gondola, sounds in the water recorded with hydrophones, snapping shrimp, dolphin’s whistle, ship noise. 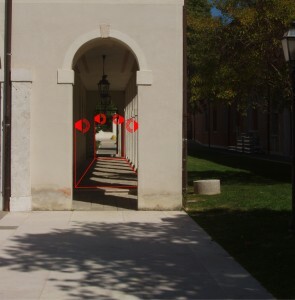 The sound piece was placed in this colonnade that surrounds the 8th century Benedictine monastery on San Servolo. The sound installation Aqua Alta is a study of Venice’s dependence on and the threat of water. Aqua Alta submerges the listener in the sounds and the effect of the water on Venice. What is heard are the sounds from the water’s edge and underwater recordings, the structural creaks of the gondolas and sounds of water flowing around and under them as they float through the lagoon. Splashes and deep wave sounds of water lapping on the buildings and stairways at the water’s edge, and the sounds of the sea life are also heard. The sound tracks of both above and below the water line were post-processed to create the sense of rising and falling of the sound field, thus mimicking both the natural effects of the tides and, overall, the slow envelopment of the sounds in air by the aquatic acoustics as the waters rise to represent the dangers to Venice of global-warming induced changes to the aquatic environment. In 2009 it was again shown in the Mobile Art Project, a touring exhibition that traveled through out Rhode Island. This is a sound piece is an ode to the 9/11 event and the World Trade Center. The Secret Arch is an interactive installation based on the secret arch, an architectural feature located at Grand Central Station, New York. There, when you whisper into one corner of the arch you can be heard clearly on the opposite side. Users of the Secret Arch were invited to interact with it by recording their passions, fears, phobias or secrets at the arch on site.